We're introduced to Clariel right after a curious and rather ominous prologue, and straight away we learn that she's been forced to leave her beloved childhood home in a country for a new life in the city that is expected to further her mother's career. Clariel is not happy about the move and never shies away from making her feelings known. She's always wanted to go off on her own and live in the forest and this move threatens to ruin everything she dreams of. As a self professed loner, there are far too many people in the city for her comfort and she's very worried her parents will try to marry her off, something she is vehemently against - since she considers herself asexual. (YAY for sexual diversity in fantasy!!) Try as she might to reason with her parents, they refuse to listen and honestly don't seem to care much about what their daughter wants because their own plans take precedence. Soon it becomes clear to Clariel that her only way out of this is to run away and return to the forest, so she begins to attempt some kind of a plan that will allow her the freedom she craves. It may have been luck that, in an attempt to see how many pages my edition of Clariel had, I stumbled upon author Garth Nix's author note at the end and discovered a huge spoiler for the titular character. I feel like knowing where her story was headed allowed me to be more accepting of her in general. In any case, because I'd read some reviews prior to starting this book, I was prepared to dislike Clariel, but I found that I couldn't. Where others criticized her for being selfish or immature, I was more sympathetic. Yes Clariel is selfish and immature, but she's sixteen! At that age, who isn't a little selfish and immature? Clariel is also caring, resourceful, independent and brave. I found that I could sympathize and even relate to her. Unfortunately she's got a lot of hurdles to jump over: her parents for one, her total lack of training with Charter Magic and the fact that she's afflicted with a fury that turns her berserk when she loses control, which is common within the Royal and Abhorsen line...and since she's descendant of both, she might have gotten a double dose. Her path is far from easy. Now I've talked about Clariel's character a lot, but this book is largely focused on the evolution of her character. Despite that, there is also quite a bit of world-building. Nix expertly introduces us the the world 600 years before the birth of Sabriel, fraught with turmoil. The Old Kingdom has always been dark and dangerous but here is a particularly tumultuous. The current Abhorsen and Abhorsen-in-waiting shy away from their duties, the Royal Line has become powerless and the government is corrupt and vying for control. All of this is supposed to be kept under wraps, but when Clariel is thrown in the thick of it, she is forced to uncover all of the secrets. In addition, Magic is seen as unseemly, which might explain why Clariel was never taught properly, which is a key focal point to her development and to the story in general. Not knowing magic in a world full of dangerous magical beings is a pretty big disadvantage and it puts Clariel in a vulnerable position, where she must learn to fight back by whatever means she can manage. When all is said and done, Clariel offers a unique and compelling glimpse into the Old Kingdom's history. It was heartbreaking, fascinating and inevitable all at once. The story ends with a definite conclusion, and yet things are also left somewhat open-ended which I thought worked well here. I'm hoping that this was done because there might be ties to the current-day Old Kingdom still left to disover. There's quite a bit of action to be had, but the focus here is on the Clariel and her world. Despite being very different and less immediately likeable than Sabriel and Lirael were, Clariel carved herself a nice little niche in my heart. I wish I could say more but we'd be going into spoiler territory. Anyone who's read this is welcome to DM me on Twitter and chat some more! I have a hard time with prequels. I'm usually so invested in the story as it is that it's hard for me to connect to whatever came before. I'm glad you felt this one was done so well. I can see how the character could be not as well liked as the others, but I'm glad you saw all the positive characteristics through the flaws. It sounds like a great addition to the series. Excellent review! I seriously need to catch up on this series because Sabriel was wonderful. Awesome review as always. I know! It seems almost too far back to be tied into the current storyline but if my hunches are correct, it will tie in perfectly! I agree, Garth Nix is very well received by the book community in general but I only got into his works last year. They've become all-time favorites though ♥ Thanks Alyssa! Oh wow... a prequel written 11 years after the trilogy ended. I can see why people had high hopes for this one. Sounds like there was a lot of world building here, and that you saw a different side to the original Kingdom. Sounds like a good read Micheline. Great review, Micheline! 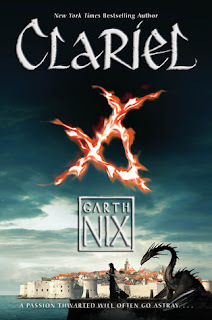 I still need to read this one - I'm really looking forward to returning to The Old Kingdom, and I'm quite pleased to hear that Clariel's little different! Not only is she only sixteen, but she's also living in a completely different time to Sabriel and Lirael with, I'm assuming, completely different hurdles. I need to get to this one soon!